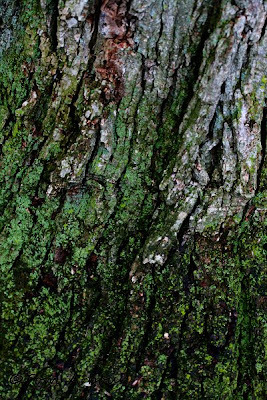 A few days ago, Tom, aka "Fishing Guy" did a "what is it post", showing three cropped images and asking his readers to guess the subject of each image. One of his images was a close up view of Lichens. 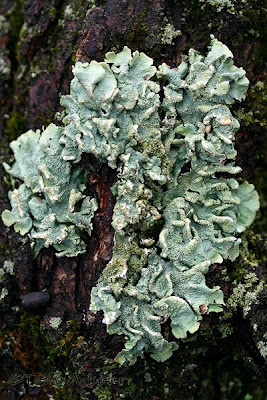 Lichens are really fascinating creatures, a symbiotic combination as two organisms, a fungi and an algae or blue green bacteria, living as one. These composite organisms are described and given species names, even though they technically are two different organisms. 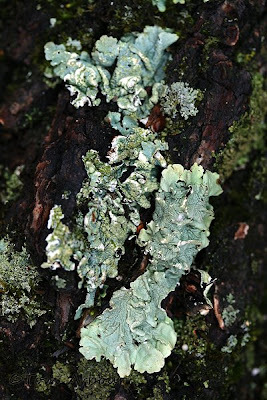 I have not studied lichens, but I do find them fascinating. 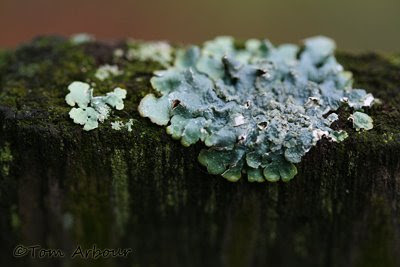 They seem to really "pop" on gray, wet days, like yesterday, so I decided to photograph some of these interesting organisms in our back yard, Mostly on fallen limbs of our Bur Oak, but also some on the fence post, and even on our concrete front porch. My question, what do you see in these lichens? Consider this a Rorschach inkblot test for naturalists. 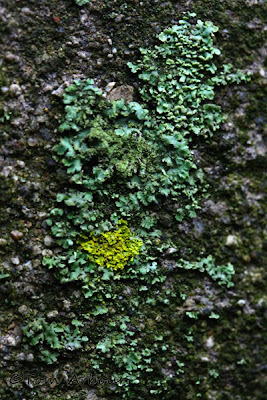 Tom: You know I see lichen so much more often since I started my blog. It is such an unusual plant. I stopped at the Kent Bog for an early Spring visit and ran into your friend Charlotte with the ONDR. She said to say hi. 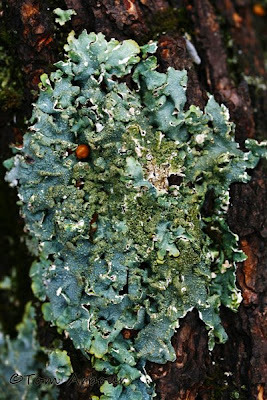 When I see lichens, I think of "little ears" - all of them listening carefully to me. I think they look like a mass of four leaf clover, like shamrocks.So lacey and delicate! You should see the lichens down here, in the heat & humidity. It's everywhere & in every color of the rainbow. I love it. Unfortunately I don't have time for the inkblot test right now, though. I hope a psychologist doesn't read this or they may cart me away to a funny farm. 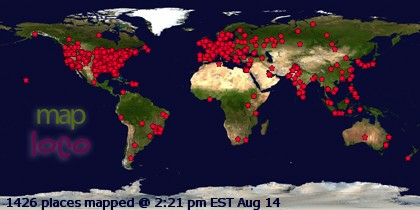 In number five I see an ancient civilization flourishing.